Supports all monitors including analog flat panel display, high resolution desktop, CAD and graphic workstations. Ideal for connecting any VGA/QXGA video with audio to any computer switch or splitter with HD15 female port. Space saving molded VGA and 3.5mm Audio cable allows for video/audio on displays and projectors without newer all-in-one connections such as HDMI. You can find quality SVGA Audio Cables at SF Cable. 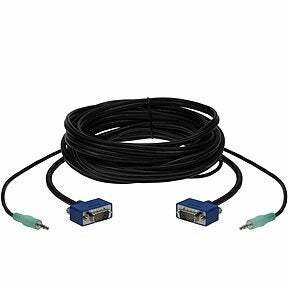 We have cables for making HD15 Male to Male connections. The connections can be Ultra Thin VGA or VGA. The length of the wires differs so you can choose the one which aligns well with your connectivity requirements. We only deal in quality products manufactured by ISO 9001-2000 registered manufacturers. All our products are RoHS compliant and environment friendly. We also offer commendable after sales service and lifetime technical support on all our products.